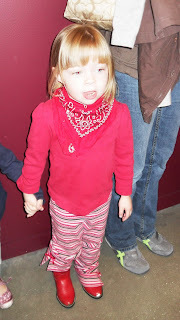 Dressing my four-year-old in the closest thing I could find to cowgirl clothes this morning (thank God for bandanas!) I pondered the reason for Go Western Day. I mean, I get the whole Texas pride thing. As a New Yorker transplanted to Houston more than 20 years ago….I’ve learned to adapt to this state’s strong roots and desire to acquire all things tight fittin’ and fringy. But really – a day devoted to dressing up our kids to fit a stereotype? Not everyone in Texas is a cowboy. We have the most diverse city…the melting pot of cultures and backgrounds and (thank God) tastes in clothing. I mean – wouldn’t it be silly if LA had Go “out of work actor day” and kids dressed up in a Chili’s uniform with three-day stubble? Or NYC Go “wall street broker day” with toddlers in a full suit with blue tooths attached to their ears and four cell phones lining their belts? I know, I know…Go “coal miner’s daughter” day?! Anyways – I think the whole thing is pretty silly – but damn if my kids don’t look like a tall glass of lemonaid on a hot summer’s day in their Texas digs. Look at Annie – any cowboy’d be proud to have her by his side. And Jackson (albeit many years ago)….couldn’t you just spread him on a cracker and eat him up?!!! LOVE the pic of Jackson!!!! Such a cutie! That's the only thing that's made me smile all day! See, it's how darn cute they look. 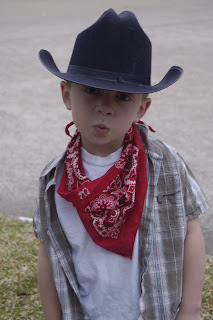 Really- Jackson is one cutie patootie cowboy!